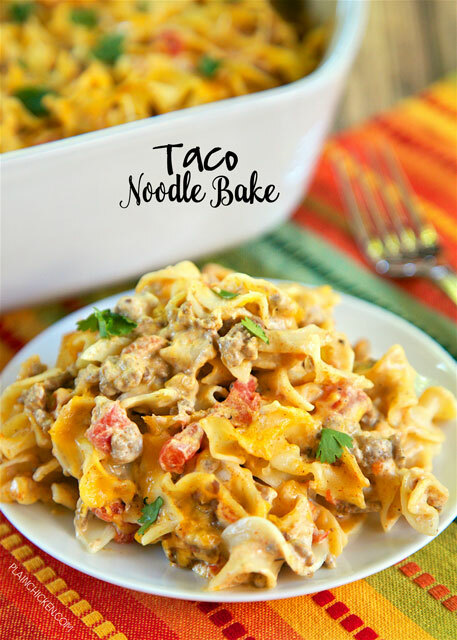 Taco Noodle Bake - SO good!!! Egg noodles, taco meat, cheese, diced tomatoes and green chiles, cheddar cheese soup and sour cream. Everyone cleaned their plate and asked for seconds! Makes a great freezer meal too!! 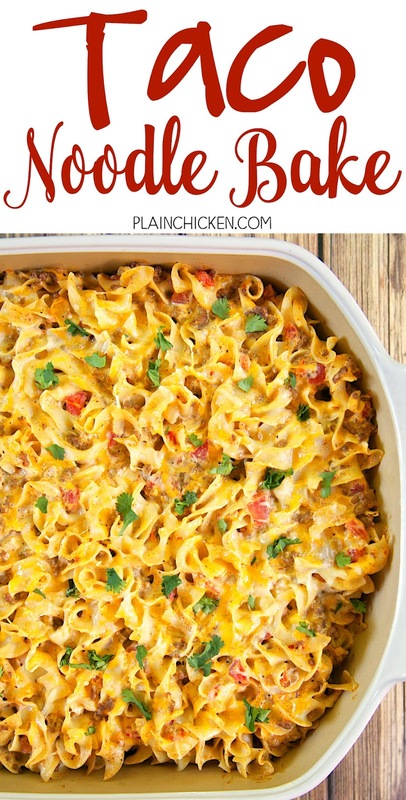 LOVE this easy Mexican casserole!!! 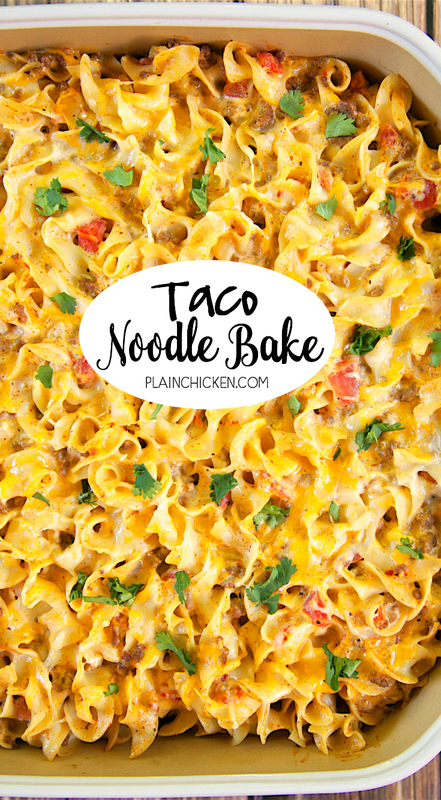 I love Mexican food and this Taco Noodle Bake is one of my new favorites! 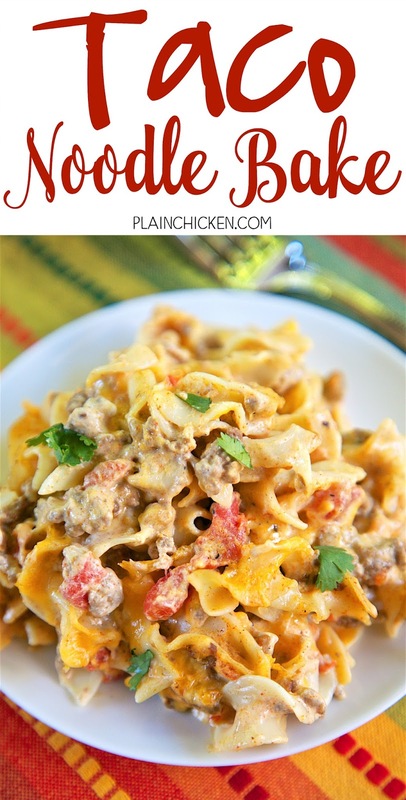 Egg noodles, taco meat, cheese, diced tomatoes and green chiles, cheddar cheese soup and sour cream - SO good!!! 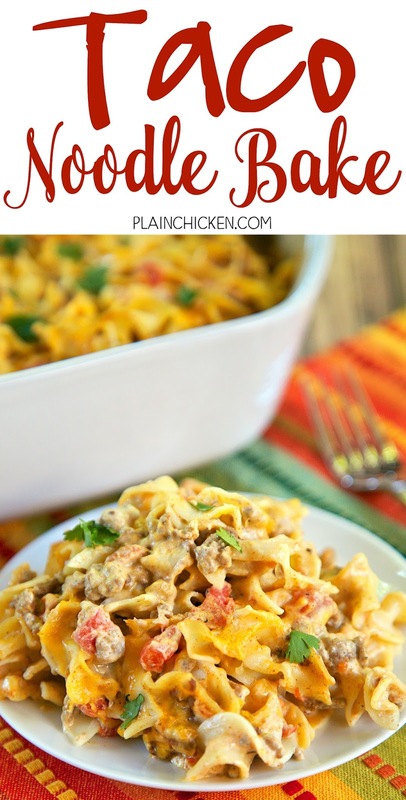 I could not stop eating this casserole! I absolutely loved all the flavors. 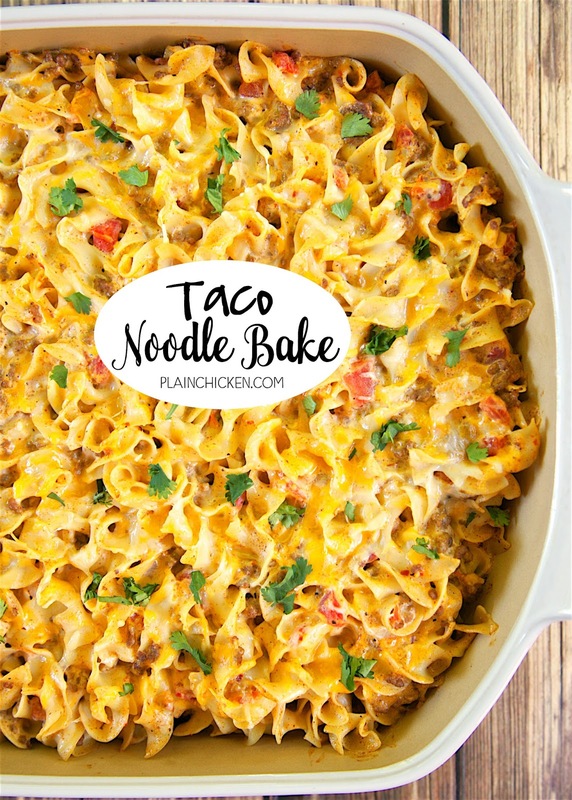 This Taco Noodle Bake has a can of Rotel diced tomatoes and green chiles. I used original and it had a small kick to it. If you are worried about the heat, make sure to use a can of Mild Rotel or just a can of plain diced tomatoes. This casserole can be made ahead of time and frozen for later. If you want to freeze it, assemble the casserole, cover with foil and pop in the freeze unbaked. When you are ready to bake the casserole, put it in the refrigerator the night before to thaw and bake uncovered according to the directions. Cook ground beef in a large skillet until no longer pink. Drain fat. Add taco seasoning and water to skillet and cook for 5 minutes. Set aside. 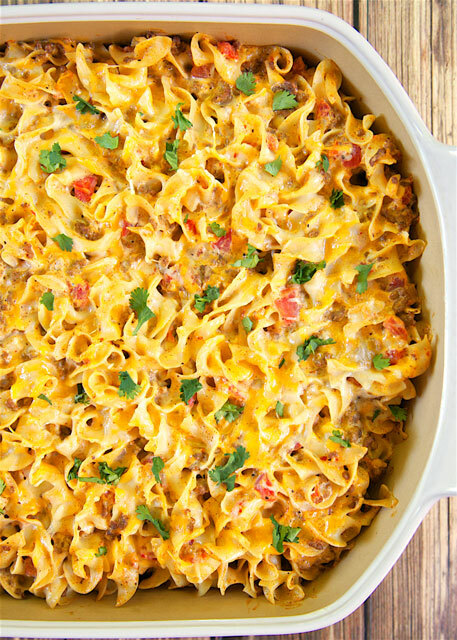 In a large bowl, combine cooked taco meat, Rotel, cooked noodles, cheese soup, sour cream, and cheddar cheese. Mix until throughly combined. Bake uncovered for 25 to 30 minutes, until bubbly. Fixed it - Thank you!! Hope you enjoy the casserole! Making tonight! Yum can't wait! Looks delicious! What sides would go well with a helping of this casserole? I'm drawing a blank! We usually eat some Southwestern Black Beans. I also have a Southwestern Green Bean casserole on the site. hello, you say to combine all ingredients, along with "cheddar cheese", how much?? It is listed above - the last ingredient. 2 cups. ?? oops, disregard idiot question! i see it now.... thanks! Made this for dinner tonight! It was a huge hit even with my boys who are anti pasta. They are weird and dont even like spaghetti. This though, they ate and ate. My 5 year old daughter gobbled it up saying this is just sooooo good!!! My 10 year old son after his second helping said I wish I wasn't full cuz I want more! My husband also loved it and suggested next time and there will be a next time he said, to crush up some corn chips or doritos on top. My 10 year old said I should add some black beans to it. Yes. This is a keeper. I like the recipe, but I found it amounted to too much sauce in comparison to the amount of noodles. I reduced the sour cream to 1 cup and I sautéed onions and peppers to add in.